Very pleased with the service and help with all three purchases. My rep is great! The rep was very knowledgeable and gave me a short educational course on the benefits of both investment coins and bullion. I'm a first-time buyer. You have a very informative website and competitive prices. Will buy again. I plan to continue buying from the U.S. Gold Bureau. Thanks mostly to the person I bought from. 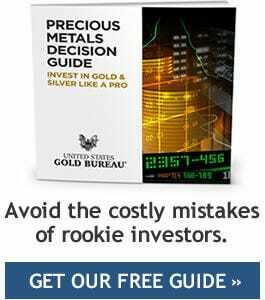 Your company made the process of purchasing precious metals easy and exciting. Very happy with the service I received. These coins should be graded WOW. Beautiful. My sales professional gave me excellent advice with regard to my recent purchase. I will recommend you to my friends! This is the first time we've bought gold or silver. Our advisor was extremely helpful explaining the different options. My advisor has been way more helpful and informative than anyone else in this industry I've talked to. This was my first time investing in metals. My rep did an excellent job educating me on the process. I really appreciate the cost aspect. You're cheaper than my local guy. Always a pleasure to make my investment with your company. Very friendly agents. Another job well done. Just like clock-work.